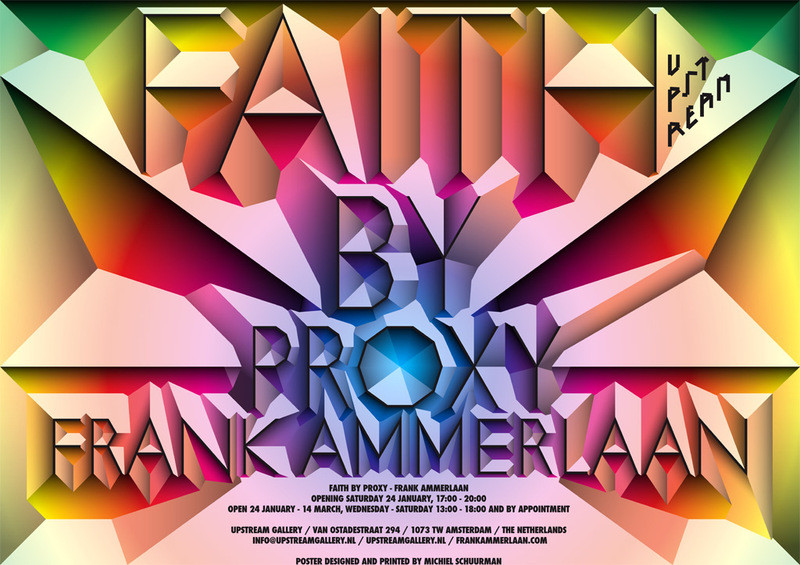 Upstream Gallery proudly presents Faith by Proxy, its second solo show by Frank Ammerlaan, bringing together a new body of work with video, painting and sculpture. In the exhibition Ammerlaan researches the complex relationship between faith and reason. On the one side an emphasis on a rational and empirical discourse, a perception of things with sensory quality. In opposition the belief in trust, things with no sensory connection, ideas that only exist in our mind. It’s change versus process, the secular versus the religious. Faith by Proxy takes its name from a new 2-channel video. The work combines footage Ammerlaan shot in countries like Italy, Russia and Brazil, next to with found archival- and propaganda material from these countries. In the video the artist juxtaposes images of deviant social and religious convictions and encounters. The front space of the gallery is symmetrically organised. Two opposite walls show similar size works, though executed in different media. The large-scale diptych painting titled Stigmata has a rich, deep, almost ethereal quality of surface and yet presents an uncanny similarity of form. Under close inspection it becomes apparent that one of the paintings is in fact a copy of the other, a step-by-step re-enactment, revealing evidence of a strict and rational process. Mirrored on the opposite wall there are two metal wall sculptures of the same dimensions. The metal sheets are organised in a patchwork, merged by a rhythmic pattern of rivets. The metal components have been trough an industrial electroplating process. Each reflective sheet of conductive material has been immersed into 20 different baths, normally used to preserve the material from corroding and normally only applied to small parts such as screws with a hidden or peripheral function. As a side effect, this treatment delivers an unpredictable and multicoloured patina. In the middle of the space, four columns of ready-made green objects are ominously hanging from the ceiling. These unusual totemic objects are made of glass disc insulators with non-conductive properties, normally used in high voltage transmission towers obstructing the currency. Presented as static transparent objects, taken out of their peripheral context, they form a new central space in the exhibition. Frank Ammerlaan (1979) is based in Londen. He studied at the Gerrit Rietveld Academie en got his MA at the Royal College of Art in London. Prizes he won include the Scheffer Prize (2013), the Royal Prize of Painting, the Land Securities Prize RCA, the Doha Studio Art Prize (all 2012) and the Gerrit Rietveld Academy Painting Prize (2007). He had solo exhibitions at the Dordrechts Museum, Museo d'Arte Conteporanea Calasetta and at different international galleries. His work has been included in a number of group exhibitions in and outside of the Netherlands, at places such as White Cube Gallery, KUMU Art Museum in Tallinn, the Royal Palace in Amsterdam and NEST in The Hague. Ammerlaan is one of the founders of artist-run initiative De Service Garage. His work is part of leading private and corporate art collections and museums such as Gemeentemuseum Den Haag and Museum Voorlinden.